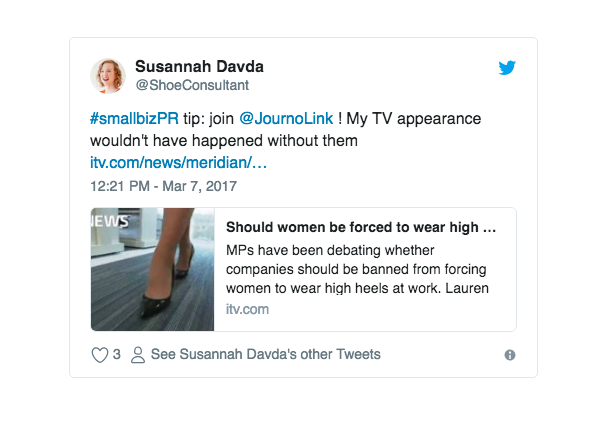 The story of Susannah, founder of the Shoe Consultant, who got amazing coverage with the help of JournoLink by reacting on the news and positioning herself as an expert in the shoe industry. What is The Shoe Consultant? I’ve worked in the footwear industry since I was 16. Starting as a sales assistant in shoe shops as a teenager, I went on to study for my degree in Footwear Design. When I decided to start my own business, it was because I wanted to use my footwear expertise to help people. I help women to find comfortable, beautiful shoes through my Shoe Wardrobe Analysis and VIP Shoe Shopping services. I also consult for shoe start-ups and brands, helping them to make great looking shoes which their customers can wear without pain. PR is a great way of getting in front of your potential customers. The public is becoming more discerning, and don’t always like the feeling of being advertised to. PR is a softer, but often more effective way to increase people’s awareness of your brands and services. JournoLink is an affordable way to get your press releases read by journalists from the most relevant publications to your target market. One of my business goals has been to become the expert in the UK media approach when they need comment on footwear-related stories. 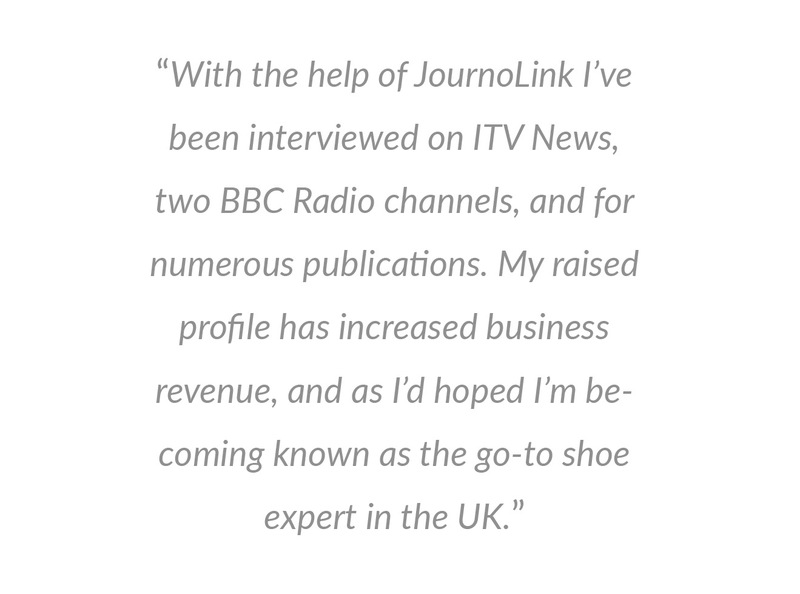 With the help of JournoLink I’ve been interviewed on ITV News, two BBC Radio channels, and for numerous publications. My raised profile has increased business revenue, and as I’d hoped I’m becoming known as the go-to shoe expert in the UK.